To the casual observer, Michael Mann appears to make stylish but conventional genre films. A closer look reveals a filmmaker who occupies a strange position in American cinema. One who works within the Hollywood machine yet also outside of it. Mann’s films may tick many genre boxes, but through their conviction, beauty and uniformly wonderful casts, they also tap into feelings and concerns not realised in typical genre pictures. The director’s painstaking research, technical skill, eye for colour and ear for music instead results in multiple breathtaking studies of professional men in crisis and their relationships. Whether using film or digital photography, style has always been key to Mann’s world. His use of colour and light is symbolic of the inner turmoil and joy of his protagonists. From his depiction of Chicago’s neon lights reflecting off car bonnets and rain soaked streets in his debut Thief (1981) to the blue, green and magenta hues of Manhunter (1986) to the nocturnal glow of the LA skyline in Collateral, Mann’s work with celluloid is stunning. From Ali (2001) onwards, Mann immersed himself in digital filmmaking technology, producing staggering imagery and pushing his work into the realm of abstract expressionism. He used digital photography to capture natural light with jaw-dropping results in Miami Vice (2006) – the titular city’s night skies radiant with pulsating purple, black and yellow tones. On other occasions, such as Public Enemies (2009), his chosen look is dark and grainy, portraying a gritty realism, with digital cameras capturing the action as though the cameramen were simply filming in the 1930s. Despite brimming with trademark examples of the director’s unique visual style and use of music, Mann’s 1983 adaptation of F Paul Wilson’s horror novel, The Keep, remains largely unseen and unknown. When discussing his filmography in interviews, Mann skips from Thief to Manhunter as though The Keep, sandwiched between them, was never made. This is because the production company, Paramount, butchered Mann’s original cut down to 96 minutes. They felt a running time in excess of three hours was too long and, given the timing of The Keep’s release, the studio may have hoped to fit it into the dominant trend for sci-fi horror films such as Alien (1979) and The Thing (1982) – pictures that featured victims being chased down by monsters. The Keep was intended to be far more than this: its source material was focused on history and mythology. By drastically reducing the film’s running time, Paramount left audiences with a baffling mess. Unsurprisingly, The Keep was a box office bomb and critical failure that Mann disowned. However, in spite of its troubled history, The Keep endures and has become a cult favourite. The Keep finds Mann delving into the world of supernatural horror, fantasy and history. The film tells the tale of a group of German soldiers occupying an imposing stone citadel in the Dinu Pass within Romania’s Carpathian mountains that contains the malevolent Golem-like entity, Radu Molasar – a colossal red-eyed monster who feeds on human life forces. For centuries it remained imprisoned within the keep, but now it has been released and begins to kill the soldiers, one by one. As a piece of cinema, The Keep overflows with arresting, haunting images which, in addition to the Tangerine Dream soundscape, arouse a combination of dread, euphoria and excitement throughout. It is quite unlike anything I have seen and boasts a stellar cast including Ian McKellen, Jurgen Prochnow and Gabriel Byrne. Yet very few have heard of it, let alone seen it. The Keep, like Mann’s position within Hollywood and American cinema over the past 30 years, is shrouded in mystery. Although he didn’t go so far as to credit direction to Alan Smithee, the pseudonym commonly given by filmmakers who hate their own work, Mann severely distanced himself from the film. He would not mention The Keep in interviews and skirted past the subject when it was discussed. Had a director’s cut been released in theatres originally, the film may have made more money and attained a reputation on a par with other Mann classics such as Heat (1995) or Last of the Mohicans (1992). But it is testament to The Keep’s power that it remains so captivating despite the fact that we are seeing just the bare bones. Watching the film again, its cult appeal is understandable. From a narrative point of view, it is rather nonsensical. Whole chunks are evidently missing so that characters appear and disappear without explanation, lines of dialogue become meaningless and events take place seemingly at random. But what the film lacks in logic, it makes up for with spellbinding visuals and sonics, containing glimpses of 80s Mann at his absolute best. Mann said he wanted The Keep to resemble a dream world and the film certainly exists in this kind of unreality. It is drenched in atmosphere, its colour palette full of blacks, dark greys and sudden shocking reds. To see the world of Michael Mann, one associated with cities, highways and night-time vistas, within the confines of this brooding, monumental medieval fortress is fascinating. If you root around charity shops, car boot sales or the horror sections of video shops, you might be able to find a copy of The Keep on VHS or even laserdisc. After Paramount ran into copyright complications relating to Tangerine Dream’s score and Mann’s contempt for the project became known, the film was never released on DVD, despite its cult following. A TV cut of the film does exist, but contains an alternate ending and is missing Tangerine Dream’s score. However, the laserdisc version of The Keep has now been released on Netflix, providing a far wider audience a chance to see the theatrical cut with the original soundtrack. Clearly, Paramount were aware the public wanted more than dusty VHS copies, laserdiscs or small clips of the film on YouTube. The studio must have seen a financial opportunity, albeit a comparatively meagre one, in releasing The Keep online. But it is still the originally released, butchered version, not Mann’s ultimate vision. Mann’s shunning of a film he poured his heart and soul into raises interesting questions over the concept of auteurship and how and why a film can become “cult”. 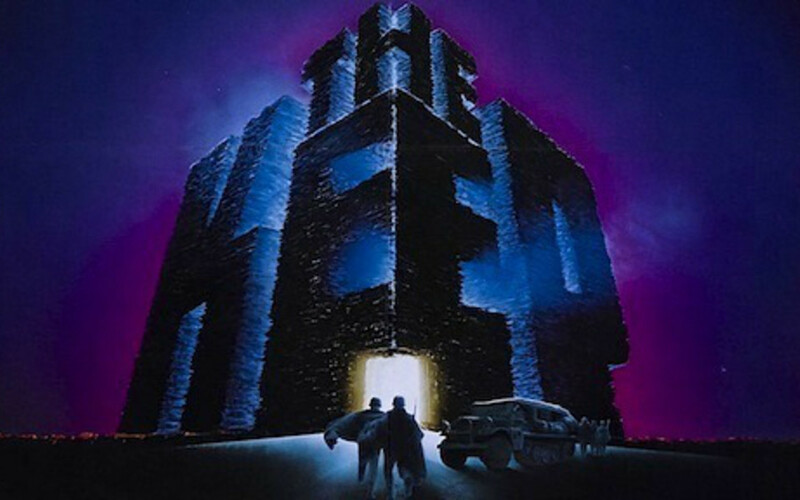 Speaking personally, The Keep was appealing because it was a Michael Mann film. His work enthralled me from my first viewing of Heat as a teenager. I rewatched my VHS copy until it nearly wore out. But Mann renounced Paramount’s version of The Keep because it desecrated the vision he had created. If we are to believe in the idea of the director as grand master, then can we still love something that Mann has washed his hands of? Is a disowned film, particularly one made by a director most would consider an auteur, still the film’s author? For many people, the idea that The Keep contains the signatures and hallmarks associated with Mann’s work is what makes the film so tantalising. Mann, like Kubrick, Haneke and many other so-called auteurs, demands total creative control. Without this he feels the film is no longer his. For the film to be Mann’s vision, he believes the final cut must be as he intended. There have been a number of auteur-directed films that, due to studio and producer interference and subsequent failure at the box office, have resulted in proud filmmakers either crediting their films to Alan Smithee or at least publicly rejecting their work in interviews. For example, Andrei Tarkovsky, much to my surprise, was disappointed with Solaris (1972) as he felt it failed to transcend genre. And, before redeeming himself with Se7en (1995) and Fight Club (1999), David Fincher famously disowned his first feature as a director, Alien 3 (1992), after constant studio interference and bullying led him to walk away before editing even began. The more experienced Alfred Hitchcock felt Rebecca (1940) was not “his” film and more super-producer David O Selznick’s baby. But amongst all the films disowned or denounced by their directors, Dune (1984) stands out most for me due to David Lynch’s position as America’s foremost living auteur, a position reflected in the term “Lynchian” being common parlance to describe his unique style. His experience of working on Dune under producer Dino De Laurentiis (who produced Michael Mann’s masterful Manhunter in the same decade) ensured the filmmaker would never again work under the constraints of a producer or studio who wanted artistic control and final cut privilege. Lynch credited direction of the subsequent 186 minute, two-part TV version to Alan Smithee while screenwriting credits were handed to the brilliantly named “Judas Booth”, a combination of Christ’s betrayer, Judas Iscariot, and John Wilkes Booth, Abraham Lincoln’s killer. Clearly Lynch was delighted with this refreshed studio-helmed cut of the film, which removed whole scenes, added others from the cutting room floor, and featured a new opening monologue. Like The Keep, Dune manages to retain a potent atmosphere that is all its own. Its imagery and characters are utterly Lynchian, despite the film being hacked into near incomprehensibility by the studio. Science fiction and big budget 80s filmmaking took David Lynch out of his comfort zone yet many scenes, such as the grotesque, sore-ridden Baron Harkonnen flying through the air to prey upon the youth that has entered his chamber, blend surreal beauty with dread and lend the film a quality that is both Lynchian and not Lynchian at all. The fact that films disowned by auteurs are still discussed is testament to the power of the director as author and visionary. Those made by journeyman directors are less interesting as they teach us nothing new about their makers, only that they have made a poor addition to an unremarkable body of work. Films such as An Alan Smithee Film: Burn Hollywood Burn (1997), Maniac Cop III: Badge of Silence (1993) or The Birds II: Land’s End (1994) are only worth commenting on for their mediocrity, rather than how the artistic ambitions of their directors were thwarted. Perhaps audiences are more willing to sympathise with adored directors being pushed by the “suits” into difficult positions where the integrity of their work is compromised. We know these filmmakers would do all they could to make a film theirs, to continue their cinematic legacy and to bring an air of completion to their filmography. Directors want total creative control and final cut of their work while fans crave repetitions of themes and styles so they can celebrate something as a Michael Mann film, a Stanley Kubrick film or an Ingmar Bergman film. The very best are perfectionists, so it is understandable that Mann would shun The Keep, Lynch would disown Dune and Tarkovsky would criticise Solaris. However, this won’t stop fans celebrating rejected, butchered or unknown works. We may lament what is missing from these films but we will also celebrate what is there – piecing together what little we can see to try and gain a better understanding of our favourite filmmakers.